Israel launched air strikes on Gaza after rockets were launched near Tel Aviv, raising fears of a serious escalation in the Israeli-Palestinian conflict. The explosions were heard in the Gaza Strip early Friday and Palestinian witnesses said Israeli planes bombed Hamas security positions. There were no immediate reports of victims. About 30 targeted attack positions held by the military wing of Hamas and their ally Islamic Jihad, causing significant damage, a security source in Gaza reports at the AFP news agency. 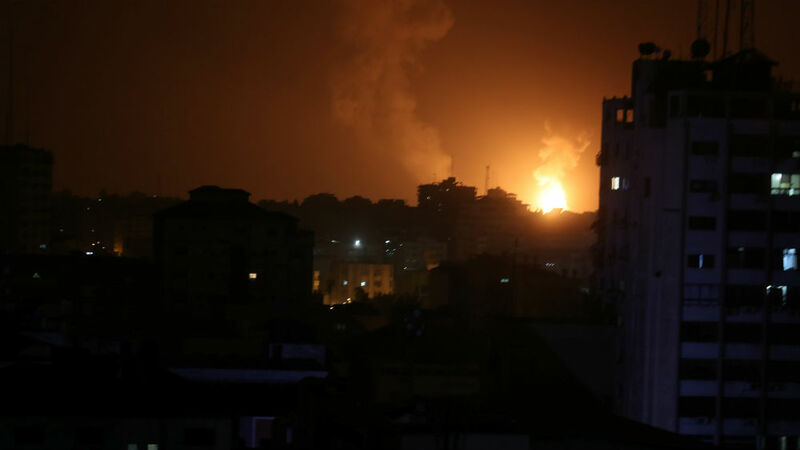 The Israeli army said it was attacking "terrorist sites" in Gaza, hours later said that two rockets were launched from the enclave in the Tel Aviv area. The air strikes took place in the southern city of Gaza in Khan Younis, about 25 km south of Gaza City. 4, marks a significant escalation that has raised the likelihood of a harsh Israeli retaliation. Rockets have unleashed anti-aircraft sirens across the city – some 80 kilometers north of Gaza – which is Israel's densely populated commercial and cultural capital. The explosions were heard in Tel Aviv and witnesses said that the Iron Dome interceptor missiles were launched into the sky and detonated – even though the military said no missiles were shot down. "I heard the rocket and the siren goes off. It was a bit surprising, I didn't think that, you know, it could really reach Tel Aviv," resident Yonah Zeff said. Naftali Bennett, the Israeli security minister, accused Hamas of responsibility. "Time to defeat Hamas. It is time to act unilaterally and demilitarize Hamas to defend Israeli citizens," Bennett said. Warplanes could be heard flying high in Gaza City, where smoke from explosions could be seen in the distance. Hamas denied responsibility for the attack on Tel Aviv, stating that the missiles were launched when the 39; the group's military wing was meeting with Egyptian mediators to try to strengthen the ceasefire with Israel. In an unusual step indicating that Hamas was attempting to prevent further escalation, the interior ministry said the rocket launch went "against the national consensus" and promised to take action against the perpetrators. Islamic Jihad and Committees of Popular Resistance, including two minor armed factions of Gaza have denied responsibility. Israel holds the Gaza rulers of Hamas responsible for all incursions out of the territory. The launch of the rocket caused no damage or casualties, but shook Israeli nerves before an April 9 election in which Prime Minister Benjamin Netanyahu is looking for a fifth mandate based on his national security and his diplomatic credentials. Netanyahu rushed to the military headquarters in Tel Aviv and was conferring with senior officers of the army. Tel Aviv Mayor Ron Huldai said he had ordered the city to open public air raid shelters as a protective measure. But he said that there are no special instructions and encouraged residents to stick to their daily habits. Israel's Netanyahu is accused of "corruption, fraud"
"Life goes on as usual," he told Channel 10 TV. "Keep calm, but be careful." Israel and Hamas have fought three wars since the group took control of Gaza in 2007. Hamas has a large arsenal of missiles and missiles, but has tried to contain the violence with Israel since the last war in 2014. Tensions have been high in the last year along the Israel-Gaza border since the Palestinians began violent protests near the Israeli border fence that often elicited a lethal response from the Israeli army. About 200 Palestinians have been killed in the demonstrations and about 60 other Palestinians have died in other incidents, including the exchange of fire across the border. Two Israeli soldiers were killed by Palestinian fire. The Thursday and Friday blaze attracted a statement of support from the United States for Israel. "Hamas and other terrorist organizations in Gaza continue to fail their people day after day and drag Gaza further and further down by constantly choosing violence," Jason Greenblatt, the Middle East correspondent for the White House. "This method will never work."